I recently saw a guy who quartered one slide and then quartered the quarters, allowing him to put 16 charts on one slide. Needless to say, it looked like an aerial view of ant farm. Even more remarkable no one in the audience (of over 300) said a word. Maybe they were asleep by then? That story comes from some work I did with the Navy. That presentation was part of 3-day, 300-attendee conference, during which dozens of equally poor presentations were delivered. Interestingly, at one point during the conference, a speaker, an assistant secretary of defense who did not have a PowerPoint but a real speech, mentioned that according to his research, 250 man hours were spent preparing PowerPoints each day at the Pentagon. I remember because it was so stunning a statistic. I don’t recall the context of his remark but he was a take action guy and I suspect he was frustrated with all the PowerPoints. Which brings me to one other story. I attended another Navy conference, this one with only 35 attendees, all active duty officers. 986 slides were shown to this group during the three day conference. Yep, 986. Roughly one every minute and a half for three 8 hour days. Can you believe it? I couldn’t. How do I know how many slides? The conference organizer handed out a Xeroxed booklet containing all the slides. I guess just in case we needed something heavy to take home. The purpose of presenting is to communicate. Your goal as a presenter is to get the audience to understand and remember what you say. Overloading them with slides doesn’t do the trick, doesn’t accomplish your goal, doesn’t bring you success. The New York Times (April 26, 2010 – We Have Met the Enemy and He Is PowerPoint) published an excellent article on the use of PowerPoint in the military. The article points out that PowerPoint is used many times to talk about things in a broad brush manner, when details on what happened, or how to accomplish things are never discussed. As one Army General stated, it takes more time, thought and effort to boil down your thoughts into succint statements, and action items, than it does to generalize with a PowerPoint presntation. 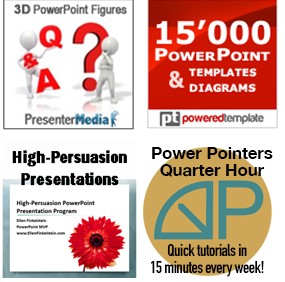 PowerPoint has become such a “crutch” that far to many people cannot make a presentation without PowerPoint at hand. The problem of over using PowerPoint presentations is of course not limited to the military. The business community and colleges have also joined in on the extreme overuse of PowerPoint. In many elementary school systems, kids are now being taught how to prepare those all important PowerPoint presentations. Use PPT as a tool to help send the message, don’t become the tool for the PPT!! You might be “stunned” by the statistic you heard of 250 man-hours spent each day at the Pentagon to prepare PowerPoint files; however, I find it quite laughable. My husband, retired Army, had three tours in the Pentagon. He jokes about working half-days, from 6 to 6. Most of his time each day, especially during his first tour as a junior officer, was spent creating these ubiquitous PowerPoint shows. His workdays were fairly routine for young staff officers assigned to the Pentagon. Just multiplying 10 man-hours times the 10 colleagues in his office would accumulate 100 man-hours of PowerPoint work in a day. What about all the other dedicated souls in all the other cubbyhole offices that make up the largest office building in the world? Depending on where you get your figures, between 23,000 and 25,000 people report to work each day at the Pentagon. A mere 250 man-hours of PowerPoint prep would suppose that barely 1% of the population is spending, at most, an hour each day in that endeavor. That would be a drop in the bucket. The Assistant Secretary of Defense whom you heard speak needs much better research. 250 THOUSAND man-hours might be an obvious exaggeration – but I would guess that number is closer to reality! I’ve heard similar stories about government offices; every situation becomes so formalized that communications that might be done verbally elsewhere require a PowerPoint presentation. It’s part of the formal documentation process.